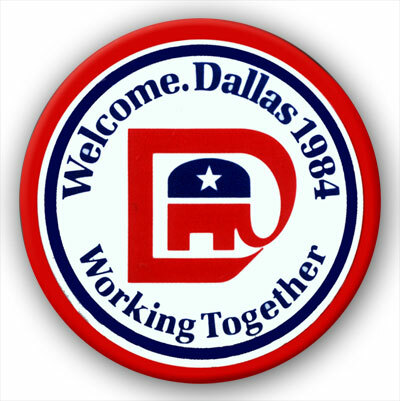 Republicans met in Dallas, Texas on August 20-23 to celebrate the Presidency of Ronald Reagan and cheer for "four more years. "Over 20,000 people with some official role at the convention, including 2235 delegates and 13,000 journalists, swamped the northeast Texas metropolis. Since the Republican Party holds its Committee (e.g. 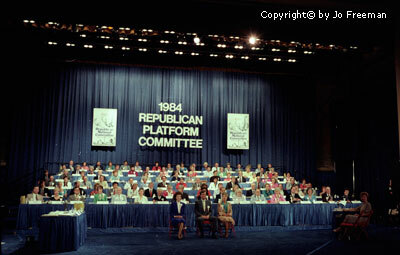 Platform, Rules, etc) deliberations the week before the convention meets, many of these came early. 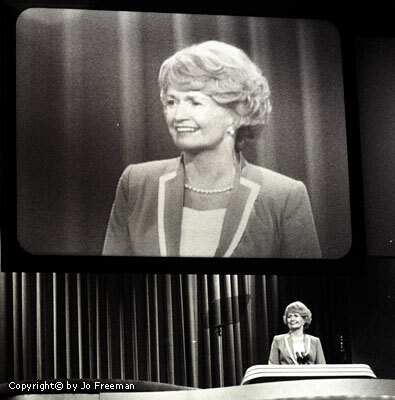 Read about the 1984 Democratic Convention and a feminist analysis of both 1984 conventions. 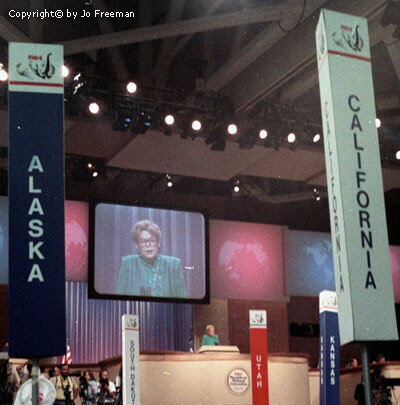 In their themes and their speakers at their 33rd national convention, the Republicans made a pitch for women's votes, having been spurred by the Democrats' selection of a woman as their candidate for Vice President. 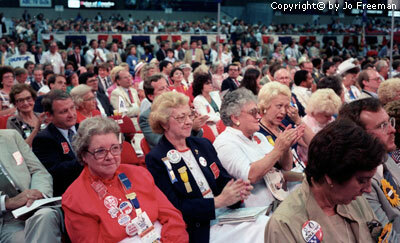 More women sat as delegates at this convention than ever before. equally divided between men and women. Several key speakers were women. Katherine Davelos Ortega, Treasurer of the United States, gave the keynote address. 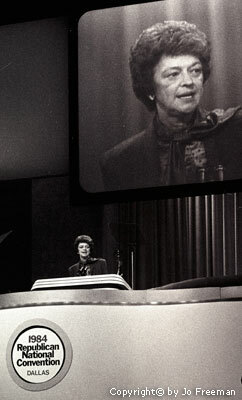 attended her first ever Republican Convention, as a major speaker. The Republican delegates loved her denunciation of Democratic foreign policy. 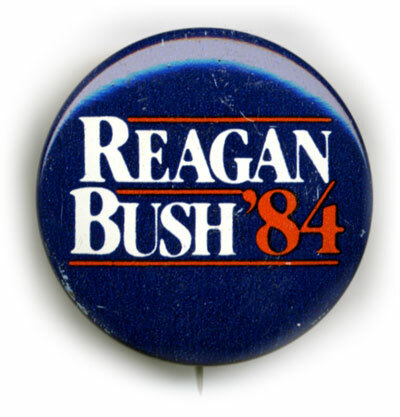 lauded President Reagan for appointing the first woman to the Supreme Court. 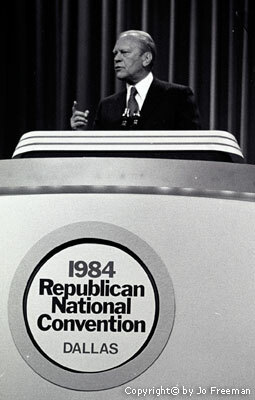 Secretary of Transportation Elizabeth Dole and Senator Robert Dole both addressed the convention. 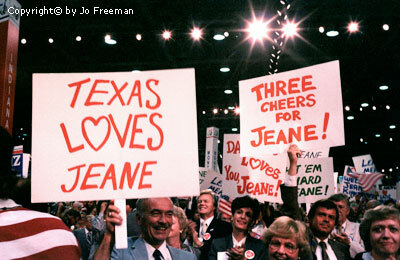 She told the convention that women were individuals and "not a voting bloc." This was a switch in the Republican line from the 1950s, when women were more likely than men to vote Republican. Then it was the Democrats who insisted that there was no such thing as a woman's vote. 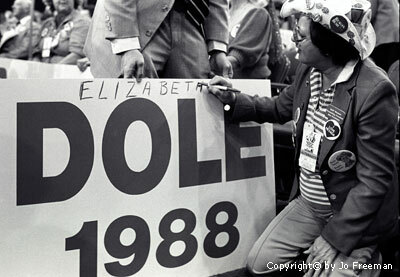 indicate which Dole they wanted to run in 1988. 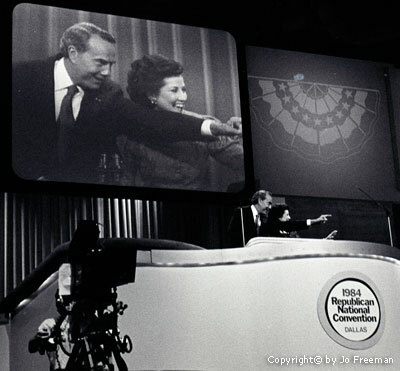 Former President Ford told CBS News that the day of the all-male political ticket was gone and that he had almost broken the barrier in 1976 when he considered Anne Armstrong, then ambassador to Britain, as his running mate. He didn't say why he chose Senator Bob Dole of Kansas instead.